Being the largest network representing older people in the EU, AGE is often asked to join EU projects to bring the perspective of our members. We only join European projects where our platform can add value, can bring the viewpoint of older people in the discussion and can support the genuine implementation of the principle of user involvement. The role of AGE in projects varies widely, from leading coordinator to partner, or member an Advisory Board or even as associated partner, but our objective is always to voice older people’s perspectives, to effectively involve end-users at all stages, and to ensure the main ethical and legal issues are correctly addressed. AGE aims to raise awareness among older people of the most recent research that can improve their quality of life; dissemination is therefore one of AGE key activities in projects, with the goal to bring research closer to the people that can mostly benefit from it. 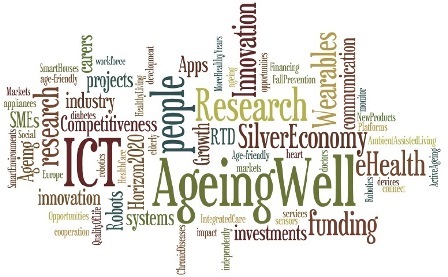 AGE can set up and manage the project Advisory Board where AGE experts, alonside with other key stakeholders, are called to provide expertise and direction to a project, to suggest improvements, to assess the evolution of some actions (e.g. the content of deliverables, the implementation of a pilot site, the accessibility of the project...), to provide the peer review of documents, to wider disseminate the project’s outcomes, as well as to discuss the project’s exploitation and sustainability plans. AGE can organise User Fora, with the goal to allow older people and users to meet experts, designers, developers and researchers for co-design services and products that are meant for our ageing society. AGE provides timely feedback on e.g. deliverables and other documents, project brochures, leaflets, and dissemination materials, where it is important to get the opinion and suggestions from experienced eyes and to embed older people's view. AGE is moreover committed to bridge projects and policies activities, especially at European level. AGE indeed feeds the projects’ activities, e.g. by providing insights from the national and European policy perspectives, by presenting inputs, best practices and feedback coming from its experts and members, by highlighting interesting events even at national and regional level, by sending information regarding policy developments and/or raising concerns. In such a way, AGE works for narrowing the gap between the policy areas, the projects and research activities. AGE’s activities in research projects are fully financed by the projects’ programmes, namely the Horizon2020 Programme, ERASMUS+ and the COSME Programme.